Let us handle the tedious work of packaging, testing, deploying, and troubleshooting application updates in your SCCM environment. Easily extend Microsoft SCCM to patch over 320+ third-party updates across 180+ of the most common enterprise products. Save time, money, and stay secure by automating the publishing of third-party updates to your environment. Setup only takes minutes. Integrate third-party patch management into Microsoft SCCM and maximize ROI with our Third-Party Update Catalog. Patch My PC Home Updater is a free portable utility for updating apps on your home PC to help you stay secure. What's the Difference Between the Basic, Enterprise, and Enterprise Plus Subscription? The Basic Subscription subscription will only support publishing our catalog to WSUS from Microsoft SCUP. SCUP publishing doesn’t support automated publishing. You will need to manually import and publish third-party updates whenever there is a catalog update. The Enterprise Subscription would support publishing our catalog automatically using our publishing service or the SCCM 1806+ third-party software update catalogs feature. Our publishing service does support extra customization options (see chart below) that wouldn’t be available when using the SCCM 1806+ in-console publishing feature. The Enterprise Plus Subscription contains all the feature of Entperise, and also allows the creation of base installation packages in SCCM. What's the Difference Between Our Publishing Service and SCCM 1806+ In-Console Publishing? Most of our customers choose our publishing service over SCCM 1806+ in-console publishing since it offers better automation and helpful deployment options. SCCM 1806+ doesn't currently support full automation, because it only publishes updates using metadata-only. This video describes the manual full-content publishing step required when using SCCM publishing. SCCM 1806+ only synchronizes the catalog automatically every 7 days. With the publishing service, you have total control over the catalog synchronization. Our publishing service does offer some helpful options when performing updates such as running customer pre/post update scripts, skipping the update if the application is in use, deleting public desktop shortcuts, disable products self-update feature, creating standard installation logs, and republishing updates. What are the Available Purchase and Payment Methods? Starting on December 1, 2018, we now offer a 1, 2, and 3-year subscription options for our Enterprise Catalog subscription. We only offer a 1-year subscription level for the Basic Catalog subscription. Reseller On-boarding, Quotes, Terms and Discounts? All you need to do is request a quote and purchase on behalf of your client (a contract is not required). On the quote request form, choose "Yes, I'm purchasing for another customer" for "Are You A Reseller Purchasing For Another Company?" You must enter the end user company name, contact name, and contact email. We require the end user contact details for subscription delivery and expiration notifications. You will need to ensure you get your client's current computer count for the quote for the following question. We use Net 30 terms for any invoices unless otherwise agreed upon prior to receiving a purchase order. We can provide a reseller discount between 3-5% depending on purchase amounts. Due to our highly competitive base pricing, we can't offer a higher reseller discount. Are Discounts Available for Education, Non-Profit, and Large Volume? We offer a standard 10% discount for education customers. Please let us know in the comments on the quote request form if you are in education. We offer a standard 10% discount for non-profit organizations. Please let us know in the comments on the quote request form if your organization is non-profit. We can offer volume discounts for larger environments. Volume discounts generally start around the 5,000 devices. Can I Exclude Devices I Won't Deploy Third-Party Updates to from My License Count? Yes, we always try to keep things simple for our customers and avoid nickel and diming them! If you have a scenario, where you know you won't deploy third-party updates to specific devices, they can be excluded from your license count! Excluding servers, if they will never be in a collection, where third-party updates are targetted. Mission critical devices that you can't receive third-party updates. Can I Use the Same Catalog Subscription in Multiple Environments? You can use the same catalog subscription in multiple environments as long as the client count for all locations where factored into the initial purchase. For example, you could use the same catalog subscription in Development, Quality Assurance, Production environments. Can I Exceed the Purchased Client Count Within a Subscription Year? We try to reduce friction for our customers wherever possible. 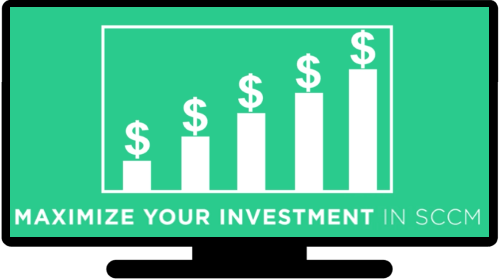 We allow up to 25% client growth within a subscription year from the initially purchased device count. We determined 25% growth will cover normal device fluctuations within one year period. If you are in a scenario where the growth has exceeded 25%, please use our contact form to determine if a true-up for the current subscription year would be required. How are Notifications Sent Out for Subscription Renewal Reminders? 60 Days Before Expiration - This will be the first notification email letting you know the expiration date and how to start the renewal process. 30 Days Before Expiration - This will be the second notification email letting you know the subscription will be expiring in one month. 15 Days Before Expiration - This will be the final notification email letting you know that you will lose access to our catalog subscription if no action is taken in the weeks two week for renewal. If you aren't sure the contacts associated with your account or need to add additional employees for the renewal notifications, please use our Contact Us Form. What are the Support Options, Hours and Cost? Our standard support hours are from 6 AM - 10 PM (EST / UTC -5) Monday - Friday, it's included in your catalog subscription cost. If you have a critical issue outside of standard hours, you can call the number below and choose the option to be transferred to the on-call engineer 24/7. There are a few ways you can contact support. Please choose the option that works best for you below. Facebook - Looking at options for 3rd party app management. Opinions on PatchMyPC? Reddit - 3rd party patch management with SCCM? Where Can I Find Documentation for Setting up the Third-Party Software Update Catalog? Is There a Trial Catalog Available for Proof of Concept? Yes, we have a trial catalog available for proof of concept Patch My PC Third-Party Catalog Trial. Can I Use the Third-Party Software Update Catalog with Standalone WSUS without SCCM? Yes, our publishing service has the capability in the advanced tab to make third-party software updates visible directly in the WSUS console so you can deploy third-party software updates without requiring Microsoft SCCM. Is Mac OS Supported for Software Update Installation? Our software updates are supported on Windows operating systems only. We make use of the existing SCCM and Windows update agents, so no extra client agents or scanning is required. Collecting Log Files for Support? Please send logs using a compressed ZIP file to reduce the size over email. When using the Patch My PC Publishing Service, publishing details will be saved in the PatchMyPC.log located in the <InstallDir> of the service. In the general tab, you can also click Open PatchMyPC.log. When using the SCCM In-Console Publishing Feature, publishing details will be saved in the SMS_ISVUPDATES_SYNCAGENT.log located on the top-level software update point in the site system logs folder. When troubleshooting update installation errors, we will need multiple SCCM client logs files. Please include the following logs for the %WinDir%\CCM\Logs directory. When troubleshooting update download errors, we will need the patchdownloader.log. Note: if you are using RDP the patchdownloader.log may be in a random folder name in the temp directory use %temp% to get to the RDP redirected temporary directory for your profile. What is the Turnaround Time for Third-Party Software Updates to be Added to the Catalog? Generally, we can detect, validate, and release new updates on the same day the vendor's release the update. Updates released later in the afternoon (EST), are generally not published in our catalog until the following business day. Does Patch My PC Have Any Competitor Comparison Details? When we are building new features in our product, it’s always based directly on the feedback we are getting from our customers. For example, all of the custom options available for updates such as disabling self-updates, custom pre/post scripts, standard logging options, closing apps, custom command lines, and removing desktop shortcuts came from customer request! With regards to our supported products, we are only adding new products based directly on what our customers and potential customers are requesting. Over 80% of the supported products in our catalog today were from customer request. If you see a product that a competitor offers that would provide you value, please just let us know and we will get it added! We understand it may help from a decision perspective to know how one product stands out. We have a recorded live webinar showing the simplicity of our setup and deployment. If needed, we can set up a live demo with your team to answer any questions. Of course, we think the best way to understand if our solution would fit your needs is to take it for a spin! You can download our free trial, no sign-up forms required! Install it, choose some products, set a sync schedule, and see how easy keeping third-party applications patched can be! Can I Request A New Product Be Added to the Third-Party Software Update Catalog? Absolutely! We are always love adding new products that would provide value to our customer base! We have approved the majority of requested products. The criteria for approval is the product's installer/updater has the necessary detection logic, supports a silent installation, installs under SYSTEM context, and has a publicly available download URL for the update binary. A list of products requested and approved products are available on our application request page. You can request a new application on our application request page. Are Driver Updates for Dell, HP, and Lenovo Supported? We have no plans to create updates for drivers for Dell, HP, or Lenovo because each of these vendors already provides a free catalog for their drivers. For Dell and HP, you can subscribe and publish the catalog directly in the SCCM 1806+ console under the Third-Party Software Update Catalogs node. For Lenovo, add their catalog URL https://download.lenovo.com/luc/v2/LenovoUpdatesCatalog2v2.cab as a custom catalog in the SCCM 1806+ console. You can find more details about Lenovo's catalog on their forum post here. We also have a step-by-step video guide covering how to use the in-console publishing feature in SCCM 1806+, or you can review the Microsoft Docs. How Are Updates in the Catalog Tested for Installation Success? What Are Metadata-Only Updates and How to Download and Deploy Metadata-Only Updates? When you subscribe to a custom third-party software update catalog using the SCCM 1806+ third-party software update catalogs feature, updates are published as metadata-only during the catalog synchronization until you manually choose to publish the update content. You can determine if updates are metadata-only from the All Software Updates node if the updates are displayed with a blue icon. Updates published as metadata-only can't be deployed until they a re-published with full-content. If you attempt to download a metadata-only update into a deployment package, you will receive the error "All software updates in this selection are expired or meta-data only, and cannot be downloaded." In order to download and deploy third-party updates in a metadata-only state, you will need to right-click the update(s) and choose to "Publish Third-Party Software Update Content". You can review the full-content publishing progress in the SMS_ISVUPDATES_SYNCAGENT.log. The log is located on the top-level software update point in the site system Logs folder. Once the publishing of third-party update content is complete, you can sync your software update point for SCCM to pick up the change from metadata-only to full-content faster. Once the software update point sync is complete, the third-party updates should show in a normal state with a green icon meaning they are available for software update deployment. When using the third-party software updates catalogs feature directly in the SCCM 1806+ console, there is currently no way to automate the publishing of content for third-party updates. The third-party update integration in the SCCM console feature is pretty new, and we are working with the Configuration Manager product group to make this feature more automated. We recommend voting on this user voice item Automatically Publish Full Content for Third Party Software Updates. If you would like to avoid this manual step, you can use our publishing service for full automation and additional features as compared to the SCCM 1806+ third-party software update catalogs feature. Please see the comparison below. 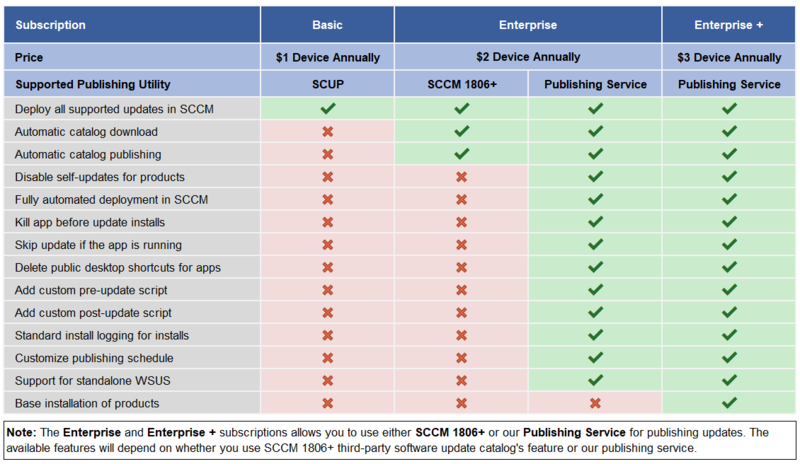 What's the Difference our Publishing Service and SCCM 1806+ In-Console Publishing? There are a few scenario's where you may need to use the Republish update(s) right-click option in our publishing service on product(s). If you add a custom pre/post script to a product, republishing is required since this change requires a binary to be added to the previously published update. If you add any custom right-click actions on a product after an update was published with full-content and if there were no other custom right-click actions enabled previously. This scenario requires us to include our PatchMyPC-ScriptRunner.exe and requires a binary change to the previously published update. If a published update was deleted from the WSUSContent folder, this scenario will cause the download of the software update into an SCCM deployment package to fail with error 404 (Not Found). Republishing the update should put the new update content in the WSUSContent folder and SCCM will be able to download the new republished update into a deployment package. The WSUS Signing Certificate has been updated and you want to republish previously published updates with the new certificate. Once you determine what product(s) meet the criteria for requiring a republish operation you can click the product, vendor, or all products level and choose the Republish update(s) item. You will be prompted whether you want to supersede the currently published updates for this product when the new updates are republished. The republishing of the selected updates will occur during the next publishing service sync. You can trigger this sync to happen right away by clicking the Run Publishing Service Sync in the Sync Schedule tab. You can monitor the SCCM software update point sync by reviewing the wsyncmgr.log. Once the sync is complete, you should see the newly republished update(s) in the console with the date appended. If you choose to supersede previously published updates for this product, you will see the previous update(s) as superseded. How do I Remove Published Updates from WSUS and SCCM? If you ever need to remove published updates from WSUS and SCCM, this operation can be performed using our publishing service. Determine what specific update(s) you want to expire/remove. In this example, we will remove the following 7-Zip updates. Next, within the publishing service go to the "Advanced" tab then click the "Modify Published Updates" wizard. Select the updates you would like to remove from WSUS/SCCM and click the "Decline Selected Updates". Note: we don't recommend using the "Delete Selected Updates" option unless you are on a call with a support engineer and instructed to do so. If you want to remove all "Patch My PC" updates or other third-party vendors, you can use the filter by vendor option and select all and decline. After the updates are declined in the publishing service, you can manually sync your software update point in SCCM for the changes to occur immediately. After the software update point sync is complete, you should see the declined updates show as expired in SCCM and will no longer be deployed. Expired updates will automatically be purged from the SCCM database after 7 days. Note: if you don't want any future updates to be published for a product, un-check the product in the publishing service, so any future updates aren't published. Do I Need to Manually Download and Import the Catalog Each Time It's Updated? The Basic Catalog subscription would only support manual importing and publishing updates within our catalog using Microsoft System Center Updates Publisher. The Enterprise Catalog subscription would support total automation for importing and publishing updates within the catalog using our publishing service or the SCCM 1806+ third-party software update catalogs feature. How are Update Binaries in our Catalog Tested for Malware? We upload all vendor installers (.EXE, .MSI, .MSP Files) to VirusTotal to ensure installers for third-party products are free of malware. VirusTotal scans each installer though over 70 different anti-virus engines. The Patch My PC catalog has saved me so much time. I used to spend so much time packaging Java installations every time there was an update. I was pleased to learn that I could also keep Skype, Zoom, Audacity and other applications that we use up to date also. I spend a fraction of the time I used to have to spend on updates. It is the best spent money in my budget. If I was unable to get our subscription approved, I would pay for it out of my own pocket. Don't tell my boss. My experience has been great from day one, I found it easy to import and publish the catalogs. Patch My PC is awesome! It has made patching our systems a breeze. I no longer have to try to find updates for all my other systems, they all just come through in one package. It has made it very easy to deploy 3rd party updates. Before we had to package each up individually and deploy them. Now we can deploy them as a Software Update, making our life much easier. The SCUP catalog made a big difference in getting our third party patching under control. Couldn't be happier. IT Dept, Hudson Advisors L.P. Very nice product and support is great when requesting a new application be added to the catalog. The catalog makes patching third party product a breeze. Patch my PC makes it easy to publish the updates to SCCM and their Update Alert Email they send is an easy way to stay on top of the latest releases. Originally we were looking for Java & some adobe software updates, to save time on having to download/package/test/deploy each month. Paying for an update catalog to cover 10+ pieces of free software for us was much cheaper than the time it took each month for our staff to do the same. PatchMyPC has helped to keep our systems up to date and when our Cyber Security team asks us to deploy a patch for a known vulnerability it is usually already scheduled or can be manually deployed with your catalog and SCUP. Thank you for your awesome product and support! The PatchMyPC catalog covers 70-80% of the 3rd party software used on campus. We primarily use it for Adobe, Java, OpenSource software (VLC, etc. ), but have found it useful for patching other heavily used software such as TeamViewer etc. that we didn't even think of beforehand. It has made patching 3rd party apps easier. The catalog is easy to use, and covers most non Microsoft products used in the organization. Great value on the license costs as well. Excellent product. The PatchMyPC catalog covers 90% of our 3rd party app's, it takes only 5 minutes a week to publish the updates. This is absolutely the most cost effective solution for 3rd party updates. I have been using the catalog for a while now, and I must say that I’m impressed by the high quality of the updates and the richness of the catalog. My main concern is the top 10 updates and they can all be found in the catalog. I used to wait for users to request updates or complain about update reminder pop-ups. Those days are over since I starting using PatchMyPC. We have a few third party apps, that Microsoft doesn't update. So it's helpful to implement Patch My PC into SCCM and deploy the updates. We have been using Patch My PC Software updates for several months now, and we're very pleased with the cost/benefit solution. The SCUP catalog is great at its price point. We have used Patch My PC to update Adobe, 7.zip, Apple Software and many others and it is wonderful. The catalog is great, and you can't beat the price of it. Overall this is an excellent product. I have had no issues integrating it into our SCCM updates environment and no issues deploying the updates. The patch roll-outs most critical to our environment are released in a timely fashion. Excellent service. We started the subscription just for being able to control Java updates via SCCM/SCUP. For Java alone the small cost is worth it. The SCUP update is usually available with a half day of the original vendor update, which is great. Thanks! We have to keep our software up to date on our workstations so that all security vulnerabilities get remediated. I used to have to download the software, build the packages, and test them before I deployed them to our workstations. This can take quite a bit of time. Patch my PC gives me that time back!! Their SCUP catalog makes it super easy. Thank you! Pays for itself in 1 month. Thanks and keep up the great work! Patch My PCs catalog saved us tremendous amount of time to effectively patch our 3rd party software. We had a very tight delay for patching high severity vulnerabilities that came in from our Infosec team. We managed to bring our sev 5 down to almost zero with the help of Patch My PC's catalog. Product has been great. We have had it in place for about a year and it patches our systems. I am very satisfied with the catalog and the continuous updates provided. We are able to update PC's with the latest patch levels in a quick and timely manner. The Patch My PC catalogue has simplified patching many applications we use. I think it is great and for the money cannot be beat. I have been using the Patch My PC SCUP Catalog for a little over a year now and have been very impressed. The catalog provides updates for most common software titles and for a few others that we needed Patch My PC was willing to add them to their list. We have used other SCUP Catalogs but none have compared with this level of support, functionality, and price. Patch My PC is by far the best product we have found to help keep our third party software updated, and I highly recommend their product. Thanks to this catalog, we can update quickly without a hassle and follow security updates of third party applications. I find Patch My PC an extremely useful tool for use in SCUP and SCCM. No issues at all. Seamless integration makes it point-click-done. We are very pleased with the PatchMyPC catalog for use in keeping our 3rd party software updated. Since it integrates with SCCM, the team finds it easy to use and works well in our monthly patching process. We've been able to reduce our software packaging workload and increase software currency as a result of utilizing it. Very pleased with the service. This product is the best I've used regarding application updates. The price and the usability has no competitor. This catalog is a big time saver regarding the amount of available application updates. Our employees are more flexible because we can allow to install software that will be patched regularly. I haven't been using it long, I'm mostly testing updates but everything looks good as I have been rolling it out. Great work! Currently we are satisfied with your catalog. Everything runs perfect. Keep it up! I've been using the SCUP update catalog for several years now. I've convinced the last two companies I've worked for to adopt the use of this product and it has saved them time and money as a direct result. The Patch My PC SCUP catalog has been a huge time saver and has made it extremely easy to roll out patches to third party apps through SCCM. I would recommend the Patch My PC SCUP catalog to any client where I need to patch third party apps. The catalog is very robust and I believe it meets the needs of most third party application update needs. I would recommend this to others. Prior to using Patch My PC's catalog, I used to spend hours porting updates into our environment taking time away from my other administrative tasks. Now I no longer have to keep on the lookout for new updates and scramble to add it to WSUS. The value is quickly realized in my work hours making this subscription easily pay for itself. After manually managing Firefox and Java updates with SCUP, the PatchMyPC.net SCUP catalog has saved me tons of time and headaches! Before we signed up we requested a couple of apps be added, two or three days later, before we even signed up, the updates were in the catalog. Having a vendor who actively responds to requests is like finding a winning lottery ticket, it just doesn't happen often. We have been a customer for many years and see no reason to make any change. Super helpful to patch all non-Microsoft 3rd party applications. The Patch My PC SCUP catalogue has allowed us to take control of Java and Adobe patches, which were previously the biggest problem outside of our SCCM environment. It is worth the money for that feature alone. Used PatchMyPC for WSUS Package Publisher. Works great with WPP too!!! Very easy to use, regular updates and good support. Streamlines the updating process, makes it much more manageable! Patch My PC delivers updates very fast and it is very easy to see in the SCCM, which Workstations needs updates. The 3rd Party patching is really great with the Patch My PC solution. We are very satisfied with the product and the service we receive. We have had suggestions to add to the catalog and within a few days they were available. Good and solid product. We would highly recommend "Patch My PC" for SCCM/WSUS integration. The ideal solution to push the updates of main software utilities (java, Chrome, Firefox, Notepad ++ ...) through SCCM and WSUS. Not having to manually create update scripts for all of the small utilities and constantly keep looking to see if there are updates for all of these products has made life so much simpler and far less time-consuming. We have been using Patch My PC on our helpdesk to bring machines up to date after imaging. When we heard that a Patch My PC SCUP catalog was available. We decided to pursue this immediately and have not been disappointed. Updates are timely and save a great deal of time packaging 3rd party custom apps. It is like having a SCUP expert on your team. Using your product has helped us maintain our clients with the latest 3rd party applications, in particular iTunes, Firefox and Chrome. It has really made our patching process easier, faster and more accurate since we moved to Patch My PC. The catalog is pretty straight forward. The migration patches for Java and Chrome make things really easy also. Overall a great product. We were glad to come across your update catalog as we were having problems with campus wide Java updates. Using your catalog makes it really easy to update Java on all our workstations. Provides an easy way of providing non Microsoft patches to our production environment. The catalogue includes most of the commonly occurring 'must patch' applications that are likely to occur on a desktop computer.